Beauty doesn’t always have to come at a price if you choose the right shapewear. Our Bali® Lace N’ Smooth® Thigh Slimmer gives you the shaping power you need in a lightweight, breathable, lace fabric. In fact, we’ve heard over and over again from our customers that our thigh slimmer is so comfortable that they forget they have it on. With just enough spandex for comfort that moves with you, our thigh slimmer shapes your rear and smooths out your trouble areas. The waistband does not roll down or slip, so you can keep everything comfortably in place with no unsightly lines or adjustments necessary. So why suffer from beauty when you can truly have it all with our Bali® Lace N’ Smooth Thigh Slimmer. The Bali® Lace ‘N Smooth Thigh Slimmer shapes your rear and smooths your waist and thighs for a sleeker silhouette. Our patented control testing, the Bali True Control System®, precisely measures the garment’s level of shaping, ensuring you always get the control you want from Bali® Shapewear. With firm control, our most popular support level, you get ideal shaping technology to minimize your trouble areas. 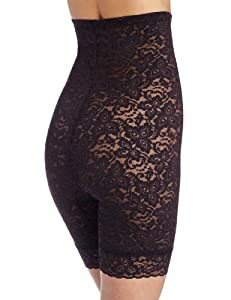 But unlike most firm shapewear that tends to bind and be uncomfortable when worn for an extended period of time, the Bali® Lace ‘N Smooth Thigh Slimmer smooths your waist, tummy, hips, and thighs while shaping your rear for all-day comfort. When figuring out the size of shapewear that is right for you, it’s important to remember that going too small will actually cause more bulging and discomfort. So when looking at our size chart, choose the dress size that you are currently wearing and that will determine the shapewear size you need. If you are currently between sizes remember to never size down. 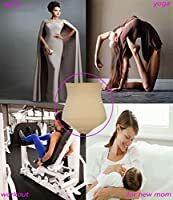 Also, when you are putting on shapewear always step into it and pull it up over your thighs and hips, this prevents shapewear from getting tangled up around your arms and head. Our thigh slimmer works great when you want to smooth out your trouble areas under skirts, dresses or slacks. It helps to eliminate bumps, lumps or bulges so you get a smooth fit every time. And because it feels so comfortable and won’t show under clothes, it works perfectly from casual wear to dressier attire.